A century before the first digital computer was invented, Ada Lovelace wrote the first computer program. Booklist - 11/01/2015 *Starred Review* Although her father, the Romantic poet Lord Byron, was bewitched by language, it was numbers that captured Ada Byron Lovelace’s imagination. Raised by her mother, known as the “Princess of Parallelograms” for her passion for geometry, young Ada filled journals with invention ideas, particularly a flying machine. When the measles left Ada blind and paralyzed for years, her mother kept her mind sharp with number problems. And, of course, Ada dreamed of her flying machine. A healthier, teenage Ada was tutored by the accomplished female mathematician Mary Fairfax Somerville, and she was introduced to Charles Babbage and his Difference Machine, a revolutionary calculator. Despite their age difference (she 17 and he 41), Ada was considered an equal, and Babbage asked for her help with his Analytical Engine, a mechanical computer. As she spent months creating an algorithm for the machine, she developed a new profession: computer programming. Soft, delicate yet detailed illustrations evoke Ada’s wonder and accomplishments, with a final spread depicting a spacecraft—a flying machine come true—running a computer language called Ada in her honor. Back matter offers more information on Ada’s life and the world’s first computer program. A beautiful tribute to this female computer pioneer. - Copyright 2015 Booklist. 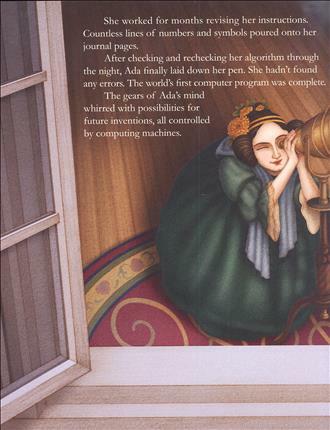 School Library Journal - 12/01/2015 Gr 1–4—This well-written and handsomely illustrated picture book biography details how Ada Lovelace Byron was able to write the first computer program more than 100 years before the first computer was built. Ever since she was a young girl, Lovelace was fascinated by numbers. As she was growing up, she filled her journals with ideas for inventions and equations. Her mother provided tutors to further develop Lovelace's passion for mathematics. When one of these tutors invited Lovelace and her mother to a gathering of scientists, she met the famous mathematician and inventor Charles Babbage. He was so impressed by Lovelace's knowledge that he invited her to his laboratory, where she learned about his idea for an Analytical Engine, a mechanical computer that would solve difficult problems by working them through step-by-step. She realized that this "computer" would only work if it were provided with detailed instructions, and after much work, she succeeded in writing what is now referred to as the first computer program and in creating the profession of computer programming. 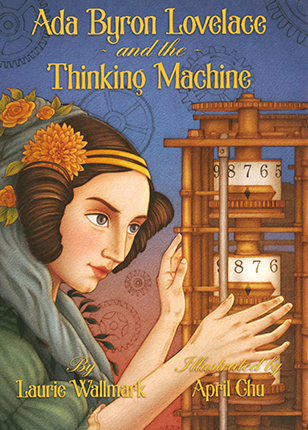 The descriptive text and dazzling spreads work seamlessly to provide a sense of Lovelace's growing passion for mathematics and invention. The illustrations reflect the 19th-century setting and contain numerous supporting details. For example, gears that will eventually become part of the design of the Analytic Engine are featured throughout: in the corners of the title page, on the pages of Ada's journals, and on Babbage's chalkboard. VERDICT An excellent addition to STEM collections.—Myra Zarnowski, City University of New York - Copyright 2015 Publishers Weekly, Library Journal and/or School Library Journal used with permission.